Banff & Buchan MSP Stewart Stevenson will officially open the Puffin Pellets wood pellet factory at Boyndie ‘Drome, by Banff at 2.20pm on Friday 29 May. Mr Stevenson will be performing the official opening in his capacity as Minister for Transport, Infrastructure & Climate Change in the Scottish Government. In addition to the opening, Puffin Pellets will be running factory tours on the day and a range of trade stands will be present for registered attendees to visit. Banff & Buchan MSP Stewart Stevenson has welcomed the news that Mike Hebden, Acting Governor of HMP Peterhead, is to be seconded to the Scottish Prison Service’s headquarters to spearhead work on the new HMP Grampian. “I am delighted that Mike will be using his wealth of experience at HMP Peterhead to help the Scottish Prison Service develop a replacement prison that meets the needs of staff and the local community. “The current prison is a major source of employment in Peterhead and its replacement represents a significant investment for people in the area. The local community campaigned hard to see a replacement prison built in Peterhead to secure the future of the staff and families that rely upon it. The Scottish Government today underlined its commitment to delivering a Greener Government, with the publication of its Carbon Management Plan. Developed in conjunction with the Carbon Trust (the independent body which works with organisations to reduce the environmental impact of their activities), the Plan sets out a number of actions which aim to reduce the organisation's carbon footprint. The Plan is published on the same day as the Scottish Government's Environmental Annual Report for 2007/08, which shows a reduction in waste produced by the Scottish Government, high levels of recycling and an increase in video conferencing. It also shows a 6 per cent increase in business travel emissions. Minister for Transport, Infrastructure and Climate Change Stewart Stevenson said: "This Government is determined to play a leading role in global efforts to reduce emissions. As part of our drive to create a Greener Scotland, we must lead by example and put our own house in order. That is why we are putting in place this Carbon Management Programme which includes specific measures to help cut our emissions. "Leading by example extends to the whole of the public sector - collectively we can make a big difference. In practice, this means scrutinising our own performance and adapting our work processes wherever we can to deliver essential carbon savings. The Carbon Management Programme will ensure the Scottish Government and other public bodies are moving in the same direction - towards a sustainable future for Scotland." Permanent Secretary Sir John Elvidge said: "Our Carbon Management Plan can make a major contribution to improving our environmental performance. While we have undertaken a range of work to drive down our carbon footprint - with initiatives on travel, waste and energy - this Plan gives us the scope to accelerate our progress towards a Greener Government. "We have worked closely with the Carbon Trust to produce this Plan. The emphasis quite rightly is on specific actions which will deliver real carbon savings. It targets the projects with the potential to deliver a 20 per cent reduction in our emissions by 2014. "We all have to take responsibility for our environmental impact and I am personally committed to ensuring the organisation makes the best possible contribution to a Greener Scotland. The Scottish Government is leading the way and I am chairing two high-level groups to drive this work forward - one to make the Scottish Government as a whole greener; and one to engage the wider public sector in the same goal." Scotland's nationwide concessionary travel scheme is to be extended to include injured forces veterans. Transport Minister Stewart Stevenson today published the results of the Scottish Government's review of the concessionary fare travel scheme. This means older and disabled passengers will continue to enjoy free travel throughout Scotland at any time on any bus route. The review - a commitment made by the previous administration - has been assessing how the scheme has been operating since its introduction in April 2006, and looking at ways to improve the scheme even further. "The concessionary fares scheme has been a widespread success, bringing free travel to elderly and disabled people across Scotland. I'm delighted to extend it so that those injured veterans who have served our country so bravely will be able to enjoy the benefits of free bus travel from Spring 2011. "Older and disabled people will continue to be able to travel for free throughout Scotland - at any time, on any bus routes, for any number of journeys. This will be a welcome boost in these difficult economic times and this Government is taking action to help householders, families and pensioners weather the current economic downturn. "As a Government we are always looking at ways to encourage people out of their cars and on to more sustainable forms of travel. This scheme has been hugely successful in increasing the use of buses and I'm confident it will continue to make an important contribution to our climate change efforts." A new £1 million fund to help create new businesses and premises for community projects has been launched by Scottish Transport Minister Stewart Stevenson. The Stations Community Regeneration Fund (SCRF) has been created to bring redundant or disused station buildings back into use for the benefit of passengers or the local community. The Minister launched the fund at The Ironing Station, an innovative business housed in the former waiting room at Dunblane Station. The Ironing Station was set up in January 2006. Within five months the business had expanded to larger premises within the station and has continued to flourish ever since. "The Stations Community Regeneration Fund is a good example of how targeted investment can help stimulate economic growth. "I believe this funding can help create a real win-win situation; passengers can benefit from improved facilities at stations, redundant buildings are brought back into use, and new opportunities for job creation and community involvement are opened up. "Here in Dunblane, The Ironing Station demonstrates just what can be achieved – it has help regenerate part of the station building and has also created a thriving local business. "I look forward to other similarly imaginative organisations coming forward with innovative proposals for station buildings in their own communities." The new fund will provide fresh impetus for ScotRail's Adopt a Station initiative, which is designed to encourage local involvement and put stations at the heart of communities. "Our Adopt a Station scheme has been a tremendous success and helps put stations at the heart of communities. "We welcome this £1m commitment which opens up new possibilities across Scotland." Banff & Buchan MSP Stewart Stevenson has welcomed the commitment made by supermarket giant ASDA to several local companies. Mr Stevenson was speaking after an event in the Scottish Parliament sponsored by ASDA to promote Scottish produce. Companies from Banffshire were represented, including Sangs of Macduff. “This was a very worthwhile event. I am very pleased to see a major supermarket such as ASDA working closely with local companies such as Sangs to promote their products to as wide a marketplace as possible. 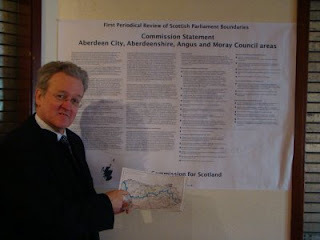 Banff & Buchan MSP Stewart Stevenson has expressed his delight at the change of heart by the Boundary Commission for Scotland who have changed the name for the proposed new Scottish Parliament constituency covering the North-east coast to “Banffshire & Buchan Coast”. Mr Stevenson campaigned hard to have the name Banffshire included in the name of the proposed new constituency instead of simply ‘Buchan Coast’ as most of the area was made up of parts of Banffshire. The SNP MSP gave evidence at the Boundary Commission’s Local Inquiry held in Buckie last November. “I am delighted that the Boundary Commission have listened to the submissions which I and others made, most recently in November, at the Local Inquiry held in Buckie last November. “The Banffshire name is still very much in active use and indeed signs have recently been erected welcoming people to the Banffshire area. It still appears on Whisky produced in the area, in our local papers and we all use it in day to day life. “I made these points to the Boundary Commission during their consultation for the last set of proposals and I am delighted by the news that they have taken heed of local feelings and have proposed to name the new constituency Banffshire & Buchan Coast”. “This is excellent news indeed and is a welcome boost to the Banffshire identity coming so soon after Moray and Aberdeenshire Councils decided to recognise local feeling by erecting signs along some of the main routes into the County advising people they were now in Banffshire. Scottish Government investment of £3.5 million has seen the return of passenger trains to Laurencekirk for the first time in over 40 years. Transport Minister Stewart Stevenson said this brings substantial benefits to the local community. The Minister was speaking as he reopened the station which had been left derelict following the Beeching cuts in the 1960s. "The new station will provide a real boost to the local community delivering more trains and new services for commuters and improving access to jobs, education and leisure. This is clearly a special day for the people of Lawrencekirk and the surrounding area, particularly those who campaigned over the years to have their station reopened and I'm delighted to join their celebrations. "This project demonstrates this Government's commitment to investing in transport infrastructure that encourages drivers out of their cars and on to more sustainable forms of travel. It is expected that this new station will attract 36,000 passengers a year and ease congestion on the local road network. "As a Government we are committed to making further improvements to Highland rail services. Through our ambitious STPR we are fast tracking work on the Highland line which will result in reduced journey times and increased services between Aberdeen and Inverness. There are also plans to improve journey times between Aberdeen and the central belt and create a new station at Dalcross." The Grade B listed station, left, has been transformed through a £3.5 million investment with Scottish Government funding provided by Transport Scotland and NESTRANS, supported by Aberdeenshire Council and a Railway Heritage Trust grant. Network Rail managed delivery of the project on Transport Scotland's behalf, with Galliford Try being awarded the design and build contract that included the refurbishment and restoration of the station building; a new accessible footbridge; two new platforms and installation of customer information systems. The station waiting room includes original wooden features and British Rail posters reclaimed from the derelict building in addition to period fireplaces that are in keeping with the features. Local secondary school, Mearns Academy, is providing artwork depicting the history of the station and area for the waiting room walls. Ron McAulay, Network Rail Director Scotland added: "This has been an extremely rewarding project to deliver, and it is one which will bring much anticipated benefits to the people of the local community. We are pleased to have been able to complete the project to the timescale we set and also to have found more than £400,000 in efficiency savings." The new station will provide a direct public transport service and commuters will be able to take advantage of 11 services northbound and 10 services southbound daily during the week. It is expected that 36,000 people will use the station each year. Steve Montgomery, managing director of ScotRail, said: "I am delighted that trains are back at Laurencekirk after an absence of more than four decades. "They provide the travelling public with a new choice on their doorstep and should also have a positive knock-on environmental impact." The scheme plays a key part in Nestrans' Regional Transport Strategy for the North East. Nestrans chairman Cllr Kevin Stewart said: "The re-opening of the station is the latest in a series of key moves to create better local rail services for the people of the north-east and we expect to see further projects come to fruition in the coming years. "We actively promoted and support this project because it broadens transport choices for people in the local area and makes for a more efficient transport network all round." In addition to the new train services, commuters can also look forward to a 70 space car park being delivered by Aberdeenshire Council which is expected to be open in July 2009. Transport Scotland is the national transport agency responsible for road, rail and national concessionary travel. Transport Scotland is an executive agency directly accountable to Scottish Ministers and came into effect January 1, 2006. Network Rail is the 'not for dividend' owner and operator of Britain's railway infrastructure, which includes the tracks, signals, tunnels, bridges, viaducts, level crossings and stations - the largest of which the company also manages. Network Rail aims to provide a safe, reliable and efficient rail infrastructure for freight and passenger trains. The anticipated final cost under Transport Scotland's implementation agreement with Network Rail is under £3.5 million. Nestrans is contributing 20 per cent of this cost and is funding the car park construction. Efficiencies worth over £400,000 have been obtained in delivery through value engineering and effective risk management. The Railway Heritage Trust awarded a grant of £150,000. Aberdeenshire Council promoted the project during feasibility. Banff & Buchan MSP Stewart Stevenson has welcomed the Scottish Government’s plans to extend free school meal provision to an additional 44,000 pupils in Scotland from August as the necessary regulations were brought before the Scottish Parliament. All pupils whose parents receive both maximum Child Tax Credit and maximum Working Tax Credit will become eligible for free school meals, meaning that low income parents in employment are not unfairly penalised. Further plans to provide all Primary 1 to Primary 3 pupils in Scotland with free school lunches will come into effect from August 2010, with the aim of encouraging healthy eating habits from a young age. “In these difficult economic times it is important that the Scottish Government does all it can to support hard pressed families cope with the downturn. By extending eligibility for free school meals to a further 44,000 children across Scotland, families can expect to save an average of £9 per week per child, a sum that quickly adds up to a significant amount. “As well as providing further financial relief for hard-working families in Banff & Buchan this measure will also help to encourage healthy eating in our children, the benefits of which can last a lifetime. “I am delighted that the SNP Government is continuing to deliver for residents of Banff & Buchan and welcome the impact that this announcement will have on family finances and on children’s health and nutrition”. The return of rail services to Clackmannanshire has seen an overwhelming 400,000 passengers take advantage of the new Stirling Alloa Kincardine railway in its first year. Passenger services returned to Alloa for the first time since 1968 when the new Alloa station opened on May 15, 2008. Almost four times as many passengers have used the service as originally anticipated since its opening 12 months ago. Strong demand has seen passenger numbers outstrip initial forecasts of 155,000 users in its first year and has led to the introduction of new direct morning and evening commuter services from Alloa to Edinburgh. Transport Minister Stewart Stevenson said: “The fantastic response from passengers over the first year of services from Alloa demonstrates how worthwhile this project has been. “Reconnecting Alloa to the rail network after a gap of 40 years has provided new education and employment opportunities for communities across central Scotland and has played an important role in creating sustainable economic growth for the area. The Stirling Alloa Kincardine rail project reopened 21km (13 miles) of existing, disused and abandoned railway line between Stirling Station and Longannet Power Station in Kincardine. The new station at Alloa allows direct hourly passenger services between Alloa, Stirling and Glasgow Queen Street and onward services from Stirling to Edinburgh. Steve Montgomery, managing director of ScotRail, added: “From 17 May, a new direct morning commuter service to Edinburgh will depart Alloa at 07.38, with a return train from Edinburgh to Alloa at 17.33. “In addition, the 23.18 Glasgow to Stirling service will be extended to Alloa, providing a new late service to the town. Clackmannanshire Council leader Janet Cadenhead said: "Clackmannanshire Council campaigned for decades for the rail link to reopen. We were always determined to make this project happen and are obviously delighted by its overwhelming success and popularity. “I'm not surprised by the figures - we always believed that the case to reopen the line was compelling and these numbers prove that it is a necessary and valuable link. "The reopening of the line is already making a significant contribution to the economic regeneration of Clackmannanshire and this progress looks set to continue. “Clackmannanshire has a great central location, and the new station allows us to make the most of our proximity to Scotland's major cities. I'm delighted that our residents are enjoying convenient, safe, fast and environmentally sound public transport in such huge numbers." SESTRANS is investigating the feasibility of extending the route from Alloa to Dunfermline to build on the success of the Stirling Alloa Kincardine railway. The announcement by the Big Lottery Fund of an award of over £380,000 to Fetterangus Community Association has been hailed by local MSP Stewart Stevenson and SNP Westminster candidate for Banff & Buchan Eilidh Whiteford as a tremendous boost to the small Buchan community. “I am delighted for Fetterangus Community Association, Chairman Colin Wood and all those involved who have helped achieve this success. "This is a substantial sum they have been awarded and clearly a lot of hard work has gone into making the application to the Big Lottery Fund in producing a bid which has secured this level of funding, so I congratulate all those involved. “This is a very exciting project which aims to allow the local community to generate its own funding for local facilities through its wind turbine project. "I am quite sure that other communities not just in Buchan but across Scotland will be keeping a close eye on this and will be looking to follow where Fetterangus is leading." A water company has announced it will help house builders by delaying the point at which connection charges are payable. The move by Scottish Water aims to ease the financial burden on developers during this present economic climate. At present, house builders have to pay their connection charges at an early stage of development and before any houses are sold. From July 1, developers will not have to make a payment until they require their first connection. Infrastructure Minister Stewart Stevenson said in a statement: "Scottish Water has continued to deliver for developers in recent years, by creating new capacity in its assets across Scotland. "This very welcome announcement will help developers' cash flows and build our efforts to support house building and protect jobs during these challenging economic times." Ronnie Mercer, chair of Scottish Water, said: "We are pleased to be able to make this positive change. New homes and new customers are also good for Scottish Water. "We are working with communities, developers and local authorities the length and breadth of Scotland to meet their needs and deliver tangible benefits through investment in clearer, fresher drinking water projects and initiatives which help protect our natural environment and deliver the additional capacity which allows communities to prosper and grow." Oxfam in Fraserburgh is set to hold a fun-day this Friday (12th May). MSP Stewart Stevenson will attend the event at 3.00pm at the event to raise awareness for the Control Arms campaign and join the Million Faces photo petition. The Fraserburgh public are invited along to enjoy special product prices and give-aways. Free tea and coffee will be on offer, as well as sweets for kids. The event aims to raise awareness for the Control Arms campaign, which calls for an International Arms Trade Treaty to govern the transfer of arms. Lack of control on the arms trade is resulting in the loss of thousands of lives every year. Supporters from over 80 countries are calling on world leaders to use their influence at next months UN conference in New York to make important steps towards the creation of a treaty. The people of Fraserburgh are urged to join the 901, 576 supporters who have already signed, by adding their face to the Million Faces campaign. “The lack of control on arms is causing unnecessary death and conflict worldwide. An International Arms Trade Treaty is therefore vital and will save thousands of lives. “The Fraserburgh public have been extremely generous and have responded well to our various appeals. The Control Arms campaign is an extremely worthwhile cause and we hope to see this support continued. 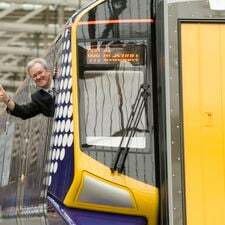 First ScotRail has revealed a mock-up model of its Class 380 train that will be introduced onto its services in Ayrshire and Inverclyde from September 2010. Following a three-day journey from Germany, the model was launched at Glasgow Central station by transport minister Stewart Stevenson, and will be on display until May 20. Made from timber with a fibre-glass exterior, the mock-up is the largest replica train to come to Scotland - at 24 metres long, by 4 metres high. The Scottish Government is taking further steps to strengthen its world leading Climate Change Bill, Stewart Stevenson confirmed today. Targets to reduce harmful greenhouse gases are being made even tougher with the inclusion of a new interim target to cut emissions by 34% by 2020. However, Ministers intend to introduce an amendment to the Bill to ensure this rises to at least 42% as soon as the EU agrees to reduce its greenhouse gas emissions by 30% by 2020. Further measures will ensure that carbon cutting action is taken in Scotland, by limiting the use of international credits. The Minister was responding to the Transport, Infrastructure and Climate Change Committee's report on the Bill ahead of the Parliamentary debate on Wednesday. "Climate change is the greatest environmental threat facing humankind and if global action isn't taken to reduce emissions significantly the world faces an uncertain future. This Scottish Government is taking a leading role, introducing the most ambitious climate change legislation anywhere in the world. "The Bill sets a target of reducing Scotland's greenhouse gas emissions by 80% by 2050, including emissions from international aviation and shipping. But 2050 is a long way off and we need to be certain we are taking effective action now. That is why this Government has insisted on the inclusion of annual targets, including the addition of a new much tougher 2020 interim target. "The actions we take today can bring clear and tangible benefits to Scotland now and in the future. In these challenging economic times we need to play to our strengths and build the low carbon economy of the future. Last week's carbon capture study shows that Scotland has the ability to safely accommodate industrial emissions generated in Scotland and North East of England for the next 200 years, confirming we are European leaders in this field. "Achieving these targets will be challenging. But I am confident that Government, business and the people of Scotland are ready to rise to the challenge." SNP Westminster candidate for Banff & Buchan Eilidh Whiteford has welcomed the publication last week by the Competition Commission of draft details of plans to set up an Ombudsman to police the new Grocery Suppliers' Code of Conduct. The move follows a long investigation dating back to May 2006 which found that the bulk buying power of certain large supermarkets adversely affected competition in the marketplace and was having a detrimental effect on suppliers. The Inquiry was set up just one month after local SNP MP Alex Salmond highlighted concerns that one particular multi-national supermarket was demanding lump-sum payments from its suppliers to meet the cost of a price-cutting promotion. "It is very much to the credit of the Competition Commission that they have pressed on with this investigation in spite of extreme pressure from the multi-national supermarkets. "The Competition Commission uncovered what they called "significant evidence" of problems in the way supermarkets treat their suppliers, which bears out the testimonies of many suppliers who have been forced into accepting cuts in payment for their produce or, in some cases, paying for the supermarkets' "two-for-one" promotions. "With the protection of an Ombudsman, suppliers will be able to invest in their business and produce a greater range of quality products for consumers without the fear that they will be blacklisted by supermarkets of face hefty losses because they have been "chosen" to fund a buy-one-get-one-free offer." "As the scheme will be funded by a complaints-based system, if the supermarkets are as ethical as they claim then they will have nothing to fear from the new Ombudsman service as the costs to them will be minimal." MSP Stewart Stevenson, along with Buchanhaven School pupils recently launched a new Peterhead path. 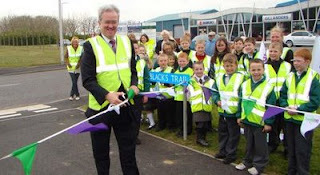 The £140,000 Maggie Black's Trail was formally opened which links the Waterside area of the town to the school - providing a safer walking and cycling route for residents. The path was funded by a Scottish Government and Sustrans "Tackling the School Run" grant and by Aberdeenshire Council. The trail was given its name after a competition held in Buchanhaven school and pupil Curtis Stephen came up with the name after researching historical personalities in the area. "This new route is a great example of pupils being able to make a safe and healthy journey to school and I'm sure it will highlight to parents the alternatives to driving their children to the school gate. "Using the new route will not only enable the pupils to undertake regular physical activity and achieve the benefits associated with that, it will also help them to learn about sustainable travel methods at an early age, both priority areas for this government."